- Island Packages with Cruises. - Island Packages - Island Hopping. 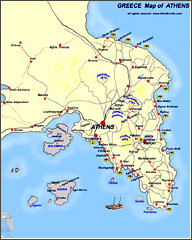 - Athens Land Tour Packages. - Greek Island Cruise Itineraries. - EROS II - (11 Days/10 Nights) - 3 Nights Athens, 4 Nights Mykonos & 4 Day Cruise. Athens, Mykonos, Kusadasi, Patmos, Heraklion, Santorini. Arrive at the Athens Airport. Transfer to the Hotel. We visit the city, the Acropolis, Parthenon and the Museum. Overnight at the hotel. Transfer to the port to embark on the ship sailing, (11:00am), to Mykonos. Arrive in Mykonos, disembark and transfer to the hotel. 3 Days at leisure to explore the “jewel” of the Aegean Sea. Early evening transfer to the port to embark on the ship, sailing at 11:00pm, for a 4 Day cruise. Today we visit two ports. Kusadasi, (7:00am -12:00pm) and Patmos, (4:00pm – 9:00pm). We visit two ports. Heraklion, (7:00 – 11:30am) and Santorini, (4:30pm – 9:00pm). Arrive at the port at 7:00am. Disembark, transfer, (on your own), to the Hotel. After breakfast transfer to the airport, (on your own).